Choose your language and 32 or 64 bit operating system and download. AutoCAD for Mac 2014 is not yet available, only the Windows version. Autodesk is about to release the latest version of its flagship design program AutoCAD 2014. AutoCAD 2014 is the 28th release of AutoCAD and is noted as being version 19.1. It continues with the AutoCAD 2013 .dwg file type and format and is supported on Windows XP, Windows 7 and Windows 8 operating systems. No official support from Autodesk will be given for Windows Vista. AutoCAD 2014 continues Autodesk’s reach for the clouds with its integration of Autodesk 360, new geographic location tool, reality capture, design feed (my personal favorite new tool), and increased control for Autodesk Exchange Apps. Autodesk also makes an attempt to protect us from malicious files with the Secureload tools. We will take a look at these new features. Autodesk is best known for its flagship design program AutoCAD. But did you know Autodesk has a mobile version of AutoCAD called AutoCAD WS? I had a chance to talk with the great people at Autodesk that manage AutoCAD WS; Ilai Rotbaein (Manager, Product Management, AutoCAD Products) and Dusty DiMercurio (Marketing Manager, Small Business). What they had to say was very interesting. 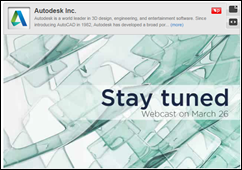 Autodesk is having a live webcast on March 26th at 8am Pacific (11 am Eastern, 3pm UK and 4 pm Europe) to announce its lineup of 2014 products. Everyone is invited to attend. You can watch the webcast on Facebook or LiveStream. They are also having a two day celebration event called Unfold. It will feature Autodesk’s 2014 animation software tools. Novedge and I will be presenting a free webinar on AutoCAD SheetsSets for Project Management tomorrow, March 20th, 2013 at 11:00 am PDT/2:00 pm EDT. Sign up now so you don’t miss it. The webinar is free (did I mention it is free?) and will last about one hour. The time frame includes a question and answer session at the end of the webinar. Not only is the webinar free, but anyone who attends gets a coupon to get 30% off the list price of my Infinite Skills Sheet Sets training Video! This video has over three hours of in depth training on using Sheet Sets. 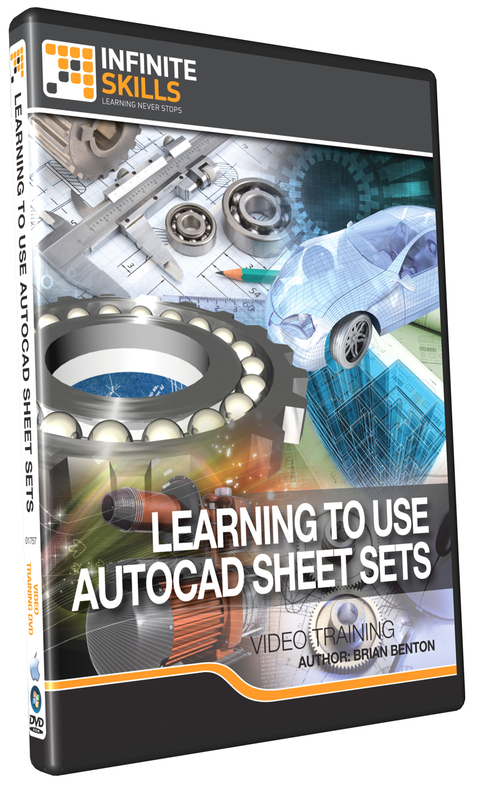 The normal list price is $49.99 (U.S.D) and comes with all of the files you will need to learn how to master AutoCAD Sheet Sets. Come on by to the webinar and get a good look at what’s on the videos. Sheet Sets do more than help you print your drawings, find out how in this FREE webinar! The State of Indiana Almost Changed the Value of Pi to 3.2! There once was legislation proposed in the State of Indiana to change the value of Pi from the commonly accepted 3.14 to 3.2. This was proposed by a hobbyist mathematician that had claimed to discover a method of “Squaring the Circle”. The hobbyist was Edward J. Goodwin, from Solitude, Indiana and was a physician. Squaring the Circle is a problem where a square is made that has the same area as a given circle by only using a small number of steps with a compass and straightedge. It has proven to be impossible to do this. 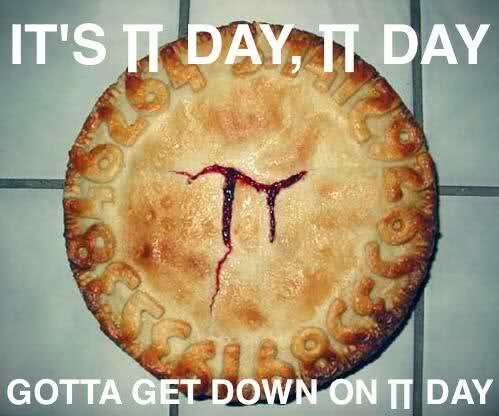 It’s Pi day, March 14th. How will you celebrate? Rhino users rejoice; the latest software version, Rhino 5, is compatible out-of-the-box with all current models of 3Dconnexion 3D mice. The introduction of Rhino 5 sets a new benchmark for how good the 3Dconnexion 3D mouse experience can be. Now, a 3D mouse provides Rhino 5 users an incomparable level of design interaction, making it a rewarding and creativity boosting tool. What’s capable with this 3D design duo? Intelligent 3D Navigation—The 3D mouse automatically follows the user's point of interest to continuously determine the optimal center of rotation. Alternatively, one can choose to rotate around a selected item. Enhanced Camera Navigation—The 3D mouse can be used to manipulate models in any of three navigation modes: Camera, Target Camera or Helicopter. Customizable Buttons— With Rhino 5’s new 3D mouse button mapping editor, it’s quick and easy for users to assign their favorite commands to the 3D mouse function keys, helping them to "stay in the zone" by reducing keyboard and standard mouse use. See the complete press release below.